In this step, you will find out what type of admissions candidate you are and where your strengths lie. Your job in this step is to give the admissions office a reason to say “yes” to your application. 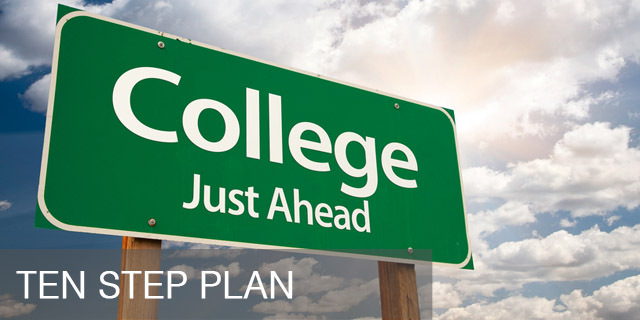 Completion of this step will help us determine the degree of interest that you have in personal, social and academic interests, and how those interests should affect your college choices. Step 2 will show you how to develop into the candidate the admissions committee is looking for. We’ll show you how to evolve into the student who is college bound based on high school performance, community activities, character and other evidences of personal strive that will impress the admissions committee. You’ll discover how to go beyond the minimum requirements of high school to become a more competitive applicant. In this step, you’ll consider colleges of different levels of selectivity, in different parts of the country. Ones that differ in characteristics such as size, academic programs, atmosphere and traditions. In doing this, you will have an advantage over many applicants who fail to diversify their applications sufficiently to avoid rejection. You’ll explore as many alternatives as possible to find schools where your strengths will be best developed. Now that you’ve determined which colleges you are seriously interested in as well as which ones that are within your academic range, you’ll begin to further gather background information about these colleges. You’ll learn how to isolate the major factors you should consider in narrowing the field of possible colleges to which you will apply. A key feature of this step is one in which you will increase your chances for admission by applying to a variety of schools where you believe your particular strengths will give you a competitive advantage. A good application can enhance your odds for admission just like a bad application can ruin your chances for admissions. In this step, you’ll learn what it takes to write winning college applications. You’ll get step-by-step instruction on how to make your applications stand out and how to get organized in order to stay on top of your paperwork. A professional looking application is a major step towards acceptance. College applications ask students to write statements and essays that reveal aspects of their nature and of the lives they lead. In Step 6, you will see how to write essays in a way that will show your feelings and experiences to awaken the reader’s interests. You will find out how to choose a topic, how to write your first draft, and how to revise and polish your draft into a good essay that honestly expresses your thoughts and personality. Just as none of us would buy a $100,000+ house without looking at it or the community, neither should we expect students to make a four-year commitment based on phone calls and literature. That’s why in Step 7, you’ll see the importance of visiting a campus before accepting an admissions offer. You will find out how to plan a good visit, what to do when you get there, who to talk to, and what questions to ask. You’ll also learn how to take control of the interview so that you can make a favorable impression. This is taught through the use of role-playing exercises that allow you to hone your skills at asking and answering questions. In step 8, you will see just how you can make extra efforts to insure recognition by the admissions committee, faculty and coaches. You’ll find out how to market your strengths to distinguish yourself from other candidates. Your objective is to persuade a committee to choose you because they are really aware of your individuality and what a difference it can make to the next freshmen class. In this step, we will walk you through the steps of applying for financial aid. You’ll learn from our examination of financial aid that a great number and variety of financial resources can put an education, at a majority of America’s most selective and expensive colleges, within your reach. With our assistance, you will find out how much money you will be expected to pay out-of-pocket for college and what resources are available now and in the next four years that you will have access to. Now that you’ve made a successful navigation of the admissions process, it’s time to make the final transition to college. When you are faced with two or more letters of acceptance and financial aid packages, you’ll find out how to make the final choice. In addition, you will be invited to workshops on “College Survival.” You will also learn what you need to pack, how to get along with your roommates, and how to manage your time and money, as well as what to do when you need help with academics, and/or emotional or physical problems.